Hindsight has marked 1968 as one of the most dramatic years in modern history. It began with the bloodshed of the Vietnam War’s Tet Offensive and continued with the assassinations of Martin Luther King and Robert Kennedy. Political unrest in the East during the Prague Spring and the subsequent Soviet invasion flamed the student uprisings in Paris and Mexico City. But heightened tensions seemed to inspire flashes of creative genius: The Beatles’ "White Album" and 2001: A Space Odyssey made dazzling debuts. Around the world, 1968 was a cultural, political and social turning point. For England, 1968 is a year of uprising, of old pre-war values making way for the very different demands of the new post-war, anti-war generation. In a dank basement on Camden Road in London, a group of young radicals are plotting the demise of the moribund establishment, united by a determination to forge a fairer, more equal society. Their weapon of choice is the poster, and this screen-printing collective calls itself the Poster Workshop. When autumn comes, they will move into the London School of Economics to support the student protest. This symbolic union of art and commerce in pursuit of social change occurs as the burgeoning advertising industry in Soho is unfurling its powers. There has been an advertising industry for decades, of course. But the industry, once dominated by former army officers creating print and poster ads for a neatly segmented society, is now grappling with mass-market commercial television, increasingly in colour, and a baby-boomer generation liberated by post-war prosperity and opportunity. This prosperity and opportunity is fuelled by, and fuels, a strong economy and low unemployment but, by the tail end of the 1960s, the economy is beginning to slow and job losses are creeping up. Big companies turn increasingly to advertising and marketing to kick-start new growth, and they find a wave of re-energised ad agencies waiting to help them. Into this potent brew comes a new magazine that will help cement the advertising industry as one of the most influential, successful and glamorous places to work. In 1967, young and ambitious entrepreneur Michael Heseltine and his brilliant business partner Lindsay Masters had been invited by the British Printing Corporation to acquire the magazine businesses it owned, so doubling the size of Haymarket, the company Heseltine had founded in 1958 as Cornmarket. Among the titles for sale was a magazine called World Press News, "a classically awful trade magazine", as Heseltine described it. But Heseltine had the idea of creating a British version of the successful American title Ad Age. WPN is rechristened Campaign and launches full tilt into the tumult of 1968. One of the more remarkable aspects of the new magazine is its design. Putting news on the front cover, like a newspaper, but printing on glossy pages, like a magazine, has since become a standard business magazine trope, but when Campaign does it first, it is pioneering. Roland Schenk, Campaign’s first art director, created an iconic style for the magazine that quickly becomes one of the most admired and respected business magazine designs in the world. The editorial content is barely less radical, celebrating and championing the industry it covers – advertising, marketing, the media, PR – but also quick to criticise and lampoon its failings. Maurice Saatchi, fresh from university, works on Campaign in these early days, though no-one can now quite say what he does. Josephine Hart, later a respected novelist and Mrs Maurice Saatchi, is the telephone sales executive. A young Robin Wight writes the subscriptions promotions. Just as Campaign is launching, so too is new advertising agency Boase Massimi Pollitt and, two years later, Maurice Saatchi joins his brother Charles in the creation of Saatchi & Saatchi. Suddenly, Campaign has a whole new generation of ambitious and driven ad executives to write about. And the industry quickly comes to recognise the value of having a confident, punchy magazine to track its successes, make the work and its creators famous and, yes, call it to account. Agencies start timing the announcement of their account wins and big people hires to coincide with the magazine’s Wednesday deadlines ahead of the Thursday morning publication. 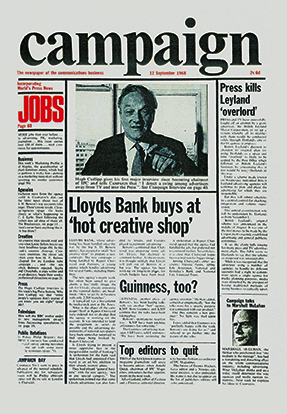 Once, in 1975, when the Saatchi brothers simply can’t hold a big breaking story until Thursday, Campaign’s then production editor Bernard Barnett and publisher Mike Potter simply bring the magazine’s publication date forward by two days to cover Saatchis’ reverse takeover of the Compton Group. The 1970s and 1980s were dominated by the growth of young, independent agencies, trailing an entrepreneurial determination that challenged the established US names such as J Walter Thompson and McCann Erickson. From Collett Dickenson Pearce’s golden years in the mid-1970s, through the rise of Saatchis, from BMP’s matching of John Webster’s creative brilliance with Stanley Pollitt’s invention of planning, to the arrival of Lowe Howard-Spink, WCRS, Bartle Bogle Hegarty, Abbott Mead Vickers, Gold Greenlees Trott and more, the fortunes of British advertising and the magazine at its heart rose together. The failing economy of the 1970s seemed only to inspire adland’s chutzpah and forge the very best creative solutions. A new wave of working-class post-room-boys-turned-admen swept through the industry, bringing with them a new generation of creatives, many of whom went on to make names for themselves in the movies or in other disciplines such as photography or writing: names like Hugh Hudson, Ridley Scott, Alan Parker and David Puttnam. And when the media independents such as The Media Business, Chris Ingram & Associates, Yershon Media and John Ayling & Associates could no longer be ignored, Campaign broadened its view beyond the big agencies and the big brands, embracing media, direct marketing and, later, digital advertising, all the while keeping pace with the rapidly expanding remit of the industry. Looking back, it’s depressing to note how narrow in some respects this expanding view really remained, how un-diverse the industry and, as a result, the pages of Campaign still were. Hindsight brings it into sharper focus than was apparent at the time, but while the industry was celebrating its growth and success, it barely paused to question whether it was sharing the opportunities out. Only now are we recognising the chances the industry missed to promote more brilliant women and recruit exciting talent from different backgrounds. Only slowly is this being set right. By the time Campaign celebrated its 30th anniversary in 1998, the editor at the time, Stefano Hatfield, wrote: "Campaign has helped define the industry it covers, for better and for worse. The magazine has been much copied at home and abroad; at times the world has clearly been watching us. But in future, perhaps, Campaign, like the UK ad industry with which it is inextricably linked, will need to devote more energy and resource to watching the rest of the world." So perhaps it is not surprising that the two decades since have been characterised by a profound international shift in Campaign’s – and the UK ad industry’s – viewpoint. As more and more of London’s entrepreneurial ad businesses sold out to global holding companies such as Omnicom, WPP, Publicis Groupe and Interpublic Group, the ad industry settled along truly international lines. More marketers sought agency partners to work with them across borders, with a consistency of service and approach, as well as cost efficiencies, which have diminished local decision-making and flexibility. Some would argue that this internationalisation has also stifled creativity, curbing the power of local agencies or marketers to fight for brave ideas and too often reducing creativity to a one-size-fits-all blandness. For Campaign, though, this relentless globalisation has encouraged the brand to embrace publishing opportunities around the world, from the acquisition of Media magazine in Asia, rebranding it as Campaign in 2000, through expansion into China, India, Japan, the Middle East, Turkey and, most recently, the US. Together these local Campaigns now collaborate to truly reflect the global nature of the industry we cover, sharing content and resources to ensure – just like the companies we write about – that we are more than the sum of our parts. We now reach a global audience nudging three million. And, of course, as agencies now can no longer be consigned to neat boxes labelled media, creative or digital, so Campaign has expanded well beyond its original remit. Campaign is now a brand for ambitious marketers every bit as it’s a brand for creative craftspeople or ad agency chiefs, though creativity in all its forms across all disciplines remains our touchstone. No longer simply a printed magazine, Campaign is now a thriving multiplatform brand around the world, reaching its audiences whenever, wherever and however they want to consume our content, whether that’s through a magazine, a website, a conference or awards night, a social-media feed, a podcast. Like the industry we still sit at the heart of, Campaign cannot and will not sit still. Welcome to the next 50 years.